In 1876, the United States, through the Reciprocity Treaty, gave the Hawaiian Islands permission to export sugar, duty free and profits from the already flourishing sugar industry soared. Infrastructure to support the booming industry multiplied, and the Hilo Railroad was born. Although not the first railway on the Big Island, the Hilo Railroad was arguably the most ambitious, and through time gained the dubious worldwide distinction of being one of the most expensive railways ever built. It began when B.F. Dillingham, an agricultural entrepreneur from Honolulu, financed the laying of tracks between the port of Hilo and Ola'a (now Kea'au), to service his Ola'a Sugar Mill. Extensions were soon built to Pahoa, where the Pahoa Lumber Company was manufacturing ohia and koa railroad ties for export to the Santa Fe Railroad. While the main business of the railroad remained the transport of raw sugar and other products to and from the mills, it also provided passenger service. Many locals rode the trains for trips to family in other towns, some students rode five days a week to classes in Hilo, and the railroad even offered late night runs to bring revelers home from special events in town. One trip offered by the railroad carried intrepid visitors most of the way to Kilauea Volcano with food and entertainment and a nights accomodation included. Visitors would travel from Hilo on rail, through Mountain View, but had to go the last eight miles by horse and wagon since the end of the rail line was in Glenwood. 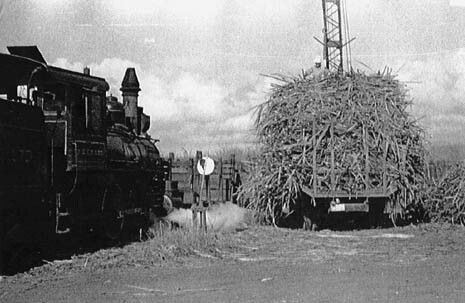 Between 1909 and 1913, the Hamakua Division of the railroad was constructed to service the sugar mills north of Hilo. 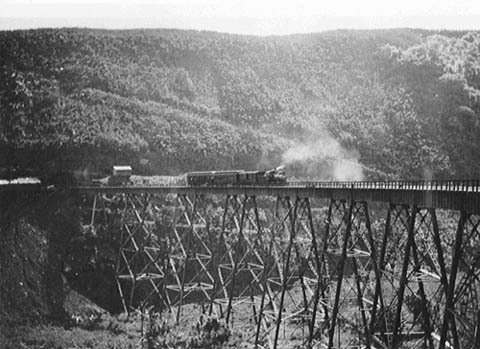 Because of the rugged nature of the Hamakua Coast, the railway had to cross hundreds of streams and valleys. Dozens of steel trestles rose over 150 feet above the streams underneath them. Over 3,100 feet of tunnels were constructed, one of which, the Maulua Tunnel, was over half a mile in length. At three enormous gulches, a combination of tunnels and distinctive curved trestles enabled the trains to negotiate the daunting topography. Unfortunately, the cost of building the Hamakua extension essentially destroyed the Hilo Railroad, which was sold to bondholders in 1916, and reorganized as the Hawaii Consolidated Railway. Targeting tourists to augment local passenger and raw sugar transport, the Hawai'i Consolidated Railway ran sight seeing specials under the name "Scenic Express." Passengers were treated to spectacular views of the rugged Hamakua Coast, pounding surf, massive cliffs, plunging waterfalls, and wild and tangled tropical vegetation. 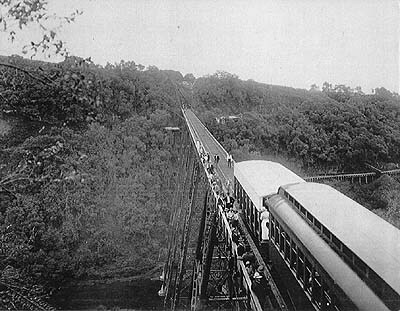 Not for the faint of heart, these trips included a stop on the trestles, where passengers disembarked to admire the outstanding scenery. Back in the train, they enjoyed carpet, wicker furniture, and a menu including consommé en tasse, tongue, fresh fruit and pot roast. The Great Depression saw a decrease in business, but business picked up in the 1940s, when thousands of battle-weary troops packed the passenger cars en route to Camp Tarawa, in Waimea, to rest, recuperate and prepare for another campaign. Oldtimers recall Marines passing meal rations through the train windows into the hands of local children, who eagerly exchanged guavas and mangoes for the G.I. treats. War-time gas rationing also increased passenger numbers. But the end was near for the Hawai'i Consolidated Railway. Early in the morning of April 1, 1946, a massive tsunami struck Hawai'i. A tragic loss of life occurred in several low-lying areas of the island chain, the east side of Hawaii island were hit the worst. The railroad line between Hilo and Pa'auilo suffered massive damage; bridges collapsed, trestles tumbled, and one engine was literally swept off the tracks. The expensive option of rebuilding the railway was rejected. Hawai'i Consolidated offered the rights-of-way, tracks and remaining bridges, trestles and tunnels to the Territory of Hawaii, but the offer was refused, and finally the company sold the entire works to the Gilmore Steel and Supply Company for $81,000. Shortly thereafter, realizing its terrible error, the Territory bought it all back for $302,723.53! Much of the current highway follows the route of the old railroad, five original railroad trestles have been converted into highway bridges. A few remnants of the railway are still visible along the coast. In Laupahoehoe, a concrete platform remains where Hula dancers once performed for tourists. And the Laupahoehoe Train Museum is housed in the former home of Mr. Stanley, the superintendent of maintenance. A superb DVD about the Hawai'i Consolidated Railway is available for sale in the museum gift shop. Called Trestles, Tunnels and Tsunamis: The Story of the Hawai'i Consolidated Railway, it is 23 minutes long, and includes striking photos of the construction and history of the making of the railway. The video can be purchased by sending $30.00 for the cost of the DVD and shipping to the Laupahoehoe Train Museum, P.O. Box 358, Laupahoehoe, HI 96764.